I’ve read a lot of great thrillers lately, and despite the fact that this has a great premise (young girls accused of murdering their best friend five years ago, reunite back in the small town that still calls them the ‘Monsters Of Brickhouse Lane’), it just falls short. Putting it another way, this was a thriller that really did end up feeling broken. Five years ago, the case against Mia and Brynn is dropped, and Owen was acquitted in court, after they were accused of brutally killing their friend Summer in what looked like a ritualistic murder. Now that a memorial has brought them back together, the three of them (along with their new tag-along friend, and so-called YouTube fashion sensation Abby), plus Brynn’s second cousin Wade, are now going to solve the murder. This plot reads immediately like it has been done before and only recently (I do not like comparing to specific books so I won’t). I will however, point out how the girls’ obsession with the book ‘The Way Into Lovelorn’ (‘fan fic’ made me do it! ), and the similarity of this obsession we see in the real life ‘Slender Man’ killings came off as all too familiar, and so it didn’t seem original or clever for me very early on. I also found myself wanting more from these passages from ‘Lovelorn’ as they gave me few answers as to why I should believe any behaviors should come from this book. As the crux of ‘Broken Things’, these passages needed to be way stronger for me to be convinced that it had anything to do with the killing, the girls’ obsession, and their friendships. 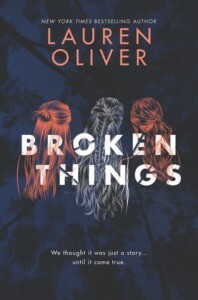 Lauren Oliver is an established and fluid writer; conversations flow well, nothing really seems ‘wrong’ in terms of how the story ‘works’, but I had a hard time getting myself through this, and at times the story seemed to be meandering. Aside from the fact that Summer, the murdered ‘best friend’, seemed to be a nasty piece of work anyway, so I didn’t really care that the others may well have bumped her off, the twist and subsequent Scooby-Doo ‘unmasking’ gave me zero payoff. I felt badly that the characters hadn’t been given more action, especially with how long the book is. Many will enjoy this thriller but sadly I have to say it’s too long, and has too much jumping around between the two main characters, Brynn (who I just can’t believe would get away with ‘living’ in rehab like she did), and Mia, and the two timelines. The relationships are half way there, and the general ambiance is generally right, but this is a very full genre right now, so I had much higher expectations for this one. 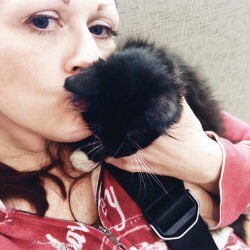 *Plus a cat was killed.